“We have all the time in world”- the immortal final words of the much maligned but later appreciated George Lazenby in On Her Majesty’s Secret Service. Louis Armstrong’s one-take recording of John Barry and Hal David’s ‘We Have All the Time in the World’ is an exquisite sweep of a song, further establishing the film series as the most seductive of them all. The Australian actor would later part ways with the burgeoning film-makers in fear of being forever type-cast as the British government’s most suave weapon: James Bond. Bond experiences love and heart-breaking loss in that sixth cinematic outing, painting a broader portrait of a character as surprisingly multi-faceted as he is smooth-talking. It would be another 37 years before we’d catch other glimpse into Bond’s psyche with the arrival of Daniel Craig as Bond in ‘Casino Royale’, a long-awaited adaption of Ian Fleming’s first James Bond novel. After the relative disappointment of ‘Quantum Of Solace’ (a film plagued by a half-finished, ad-hoc script amongst other things), it seems the hard work which produced a new James Bond for the post 9/11, Bourne-era had been short-lived. Four years had passed since the ‘Question Of Sport’ (as dubbed by film critic Mark Kermode); a couple of years of studio disruption, extraordinary casting and crew choices and prolonged hype and anticipation. The hiring of British director Sam Mendes to helm the project raised inquisitive eyebrows, eager to see what this Oscar-winning director could bring to the established brand of Bond. The announcement of the new Bond film title, ‘Skyfall’, did nothing to hint at the plot whilst the eventual release of the new theme sung and co-written by mega-star Adele hinted at a return to form. So far, so good. So did ‘Skyfall’ live up to our expectations? The verdict it seems is overwhelmingly, yes. The plot sees an action-weary Bond pitted against the changing atmosphere of terrorism, a villainous cyber-baddie and his own dogged attempts to remain useful in a new world of espionage. Stellar acting from a terrifying Javier Bardem, a mysterious Ralph Fiennes and the ultimate Bond girl Dame Judi Dench amongst others, along with Mr Mendes artful direction, Roger Deakins’ beautiful cinematography and Thomas Newman’s (Oscar-worthy, dare we say it?) musical score; ‘Skyfall’ is a revelation. In the latest instalment, Daniel Craig’s Bond emphasises what the previous incumbents had only hinted at. Helped along by a script and plot which highlight and answer the conundrum of Bond operating in the 21st century; Ian Fleming must look down baffled and yet proud of his creation, a far-cry from the character he once described as “an extremely dull, uninteresting man to whom things happened”. However in their own way, each unique actor helped propel the character of James Bond into film legend. Sean Connery is the classic Bond, George Lazenby is the ephemeral Bond, Roger Moore is the fun Bond, Timothy Dalton is the action Bond, Pierce Brosnan is the Armani Bond, and Daniel Craig – he’s the red, white and blue bulldog Bond. In fact, after eventually warming to Sean Connery as James Bond, Ian Fleming created the trait of Bond’s Scottish ancestry (which is explicitly explored in ‘Skyfall’ [spoiler!]) in the novel ‘You Only Live Twice’. With ‘Skyfall’ being the film released in the year that our world celebrates “50 Years of James Bond”, it seems fitting that traces of Ian Fleming’s immortal writing lives on into a new era of Bond film-making. Eon Productions, the company who have produced all 23 editions of the James Bond series have this year released a documentary to coincide with this auspicious anniversary. ‘Everything Or Nothing: The Untold Story Of 007’ includes interviews with five of the six Bond actors (sadly Sean Connery declined to take part), Barbara Broccoli (daughter of Albert “Cubby” Broccoli, the original producer of the film series) and Michael G. Wilson (co-producer of the later films), providing insight into the sometimes rocky development of the franchise. 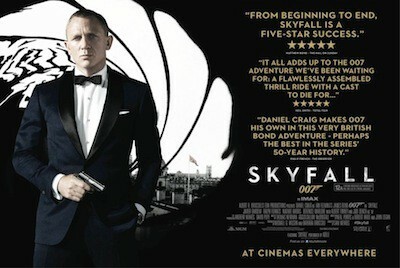 Much of ‘Skyfall’s success can be likened to another British director’s revamp of a classic series. Christopher Nolan’s ‘Batman’ trilogy, which concluded this year with ‘The Dark Knight Rises’, also serves to deconstruct an iconic character and narrate a story of struggle in a world which seems to be fighting back against the accepted norms of film heroism. Throughout ‘Skyfall’ we see Bond attempt to shoot and punch his way back to 00-status fitness and prove himself to a faithful but concerned “M” (played superbly as ever by Dame Judi Dench). Of course there’s still plenty of time for the quip one-liners and preposterous close-escapes (Kimono Dragons, anyone?) and even a few understated gadgets from a thoroughly modern computer-whizz Q, played by the likeable Ben Whishaw in geek glasses and sipping a Scrabble mug. Two more films are in the works with Daniel Craig remaining as Bond and are now working under the enormous shadow and success of ‘Skyfall’ around the world. Rumours of Sam Mendes returning to maintain his Bond-director crown continue to flourish and Supporting Actress Oscar rumours for Dame Judi are barely out of earshot. One thing is for sure, the following films have a hell of a mountain to climb to repeat the success of ‘Skyfall’ and the resounding impact it has had on the British film industry in 2012 and in toasting a cinematic juggernaut of the last 50 years. James Bond is the “lingua franca” of British Film, the international language which keeps audiences across the globe on the edge of their seats year after year. Long live Bond, James Bond. We have all the time in the world it seems.